(From left) The Apprentice School Director Everett Jordan presented the school’s 10,000th graduate, Sara Ruggles, with a plaque to commemorate the milestone as Newport News Shipbuilding President Matt Mulherin and Newport News Shipbuilding Vice President of Trade Operations Ray Bagley joined other shipyard leadership in applause. Photo by John Whalen/HII. NEWPORT NEWS, Va., March 2, 2015 (GLOBE NEWSWIRE) -- Huntington Ingalls Industries (NYSE:HII) hosted commencement exercises Saturday to graduate 157 apprentices from the company's Apprentice School located at Newport News Shipbuilding. 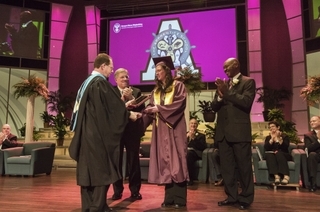 The graduation, held at the Liberty Baptist Church Worship Center in Hampton, also marked a milestone in graduating The Apprentice School's 10,000th graduate, Sara Ruggles. Retired Adm. John C. Harvey Jr., Virginia's secretary of veterans and defense affairs, delivered the commencement address. He asked the graduates to commit to Newport News' mission of "Always Good Ships" "because young sailors will walk aboard the ships you will design and build, and they will bet their lives on the work that you will do." "There is no one in any industry, anywhere in this great country, who makes a contribution to this nation's defense that is close to the contribution made by any of the great people working here at Huntington Ingalls building these great ships," Harvey said. "That is what this day is really about—how you will sustain that unique and all-important contribution as you continue your careers at Huntington Ingalls' Newport News Shipbuilding. Always good ships? That is a question I believe you must answer." Of the 157 graduates, seven are military veterans. Sixty-seven completed an optional, advanced program (advanced shipyard operations, cost estimator, modeling and simulation program analyst, and nuclear test technician or production planner). Forty-six earned "honors," eight earned "high honors," and one earned "highest honors" under the Honors Program, which combines academic and craft grades to determine overall performance. Athletic awards were presented to 21 graduates, and 12 completed their required academics with perfect 4.0 grade point averages. Newport News Shipbuilding President Matt Mulherin told the audience of graduates and their family members and friends that he was enthusiastic about the graduates' contributions toward the company's future success. "As I look into the audience, I see the future leaders of our company," he said. "Leaders who are more diverse than the team you see up here today. That is a good thing. Your diverse backgrounds, experiences and perspectives are what we need to grow and expand our business and to improve engagement across the entire shipyard." Stuart Mitchell Brauer proved himself a leader of the 2014 graduating class. He attained the highest grade point average in combined required academics and crafts, which earned him the Homer L. Ferguson Award. Brauer, who first graduated from James Madison University with a degree in business administration, reminded his fellow classmates of the national importance of their knowledge. "We are an aging business with walking libraries of knowledge retiring daily," he said. "I encourage you to continue to learn from these mentors, but to also transition to becoming a mentor yourself. Continue to ask questions and challenge old methods to discover new innovations that will keep us ahead. This company has earned the trust and respect of our customers for over a century, living up to the motto of 'Always Good Ships.' Let us give HII, NNS and The Apprentice School a return on their investment in us and uphold this reputation." The Apprentice School accepts about 225 apprentices per year. The school offers four- to eight-year, tuition-free apprenticeships in 19 trades and eight optional advanced programs. Apprentices work a 40-hour week and are paid for all work, including time spent in academic classes. Through partnerships with Thomas Nelson Community College, Tidewater Community College and Old Dominion University, The Apprentice School's academic program provides the opportunity to earn associate degrees in business administration, engineering and engineering technology and bachelor's degrees in mechanical or electrical engineering.